British-born George M. and Florence E. Dennison ran stopping places for teamsters hauling freight for the construction of the Grand Trunk and Canadian Northern Pacific railways. 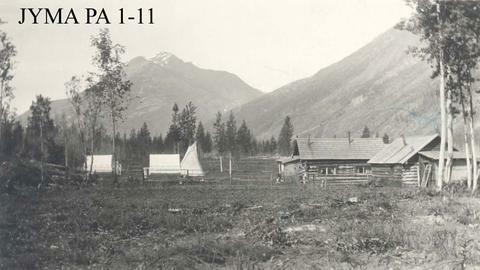 They settled in the Mount Robson area around 1910, and were granted a homestead in 1913. With his nephew Harold Britton, George ran a guide and outfitting business until the 1940s. He occasionally worked for guide Jack Brewster out of Jasper. George Dennison had been a major in the British calvary during the Boer War, and was presented to King George VI and Queen Elizabeth during the royal stop at Mount Robson in 1939. George died in the mid-1940s when he was hit by a train while on guard duty at the Japanese internment camp. He is buried at Mount Robson. Florence died at the coast in the late 1940s. The original automobile road from Tête Jaune Cache to Jasper followed the old railway tote road as far as Moose Lake, and then followed the abandoned Canadian Northern Railway grade to Jasper. According to Tom Carr, “There were two hills between Mount Robson and the Pass that took some doing to get up in any kind of adverse weather, because of the steep grade, crooked road, and dirt base. The first hill was directly in front of Dennison’s property. Because of the trouble it caused travelers by car, it warranted a name other than *&!%$!@. More politely it became known as Dennison Hill.” When the Yellowhead Highway was being built a gravel pit was opened on the top of Dennison hill.